← How is my TheGrint Golf Handicap Calculated? Improve your impact and minimize penalties! This is our second blog post of this series. 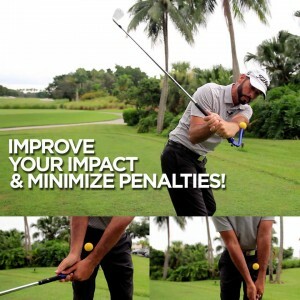 The below video with Michael Gish (the inventor of the Total Golf Trainer) is focused on helping us improve our moment of impact and therefore, minimize penalties in our scorecard. Again, this content is sponsored, but we think is pretty useful. mechanical feedback have provided a greater understanding of how the body and club move changing the landscape of golf. All these improvements still have not changed the ultimate goal of golf. Your final Score. The score is how we compare ourselves to other golfers. There is one common fundamental that every golfer can practice in order to lower their scores. This is Impact or the moment of truth when the club contacts the ball. This fundamental is the most common mistake for amateur golfers. Impact effects every shot from Chipping, Pitching to the full swing. One of the biggest amateur mistakes is trying to get under the ball, flipping or scooping causing the shaft to lean back or behind the ball at impact. This will add loft to the club, causing loss of distance and club face control. This is something that is common for every shot in golf. Do you see inconsistency in your chip shot? Some balls roll out and others stop, this is due to an inconsistent Impact position. You may be having trouble controlling your pitch shot distance and spin. This is due to an inconsistent Impact position. But what does a good Impact look like? At impact the handle of the club should be in front of the club head, resulting in a better hit-down on the ball. This is a difficult position to practice and see or feel improvement in the full swing without consistent video work and hours of lessons having a pro giving you feedback. The below video shows some drills that you can work on with the Total Golf Trainer. It provides you with feedback you can feel for improved Impact throughout your game and lower scores. You will make more chips, control your distance and spin with pitch shots, improve your ball striking and distance control with your irons to help lower your score. The Total Golf Trainer provides the feedback necessary to improve your all-around game and lower your score. * Attach Total Golf Trainer to the front of your grip (aligning the Total Golf Trainer to the club face). * Insert medium training rod into the top port. Use coupon code: THEGRINT25 to get 25% Off your first order. This entry was posted in TheRange Blog and tagged free handicap, golf, golf drills, golf handicap service, golf lesson, golf technique, golf trainer, TheGrint. Bookmark the permalink.